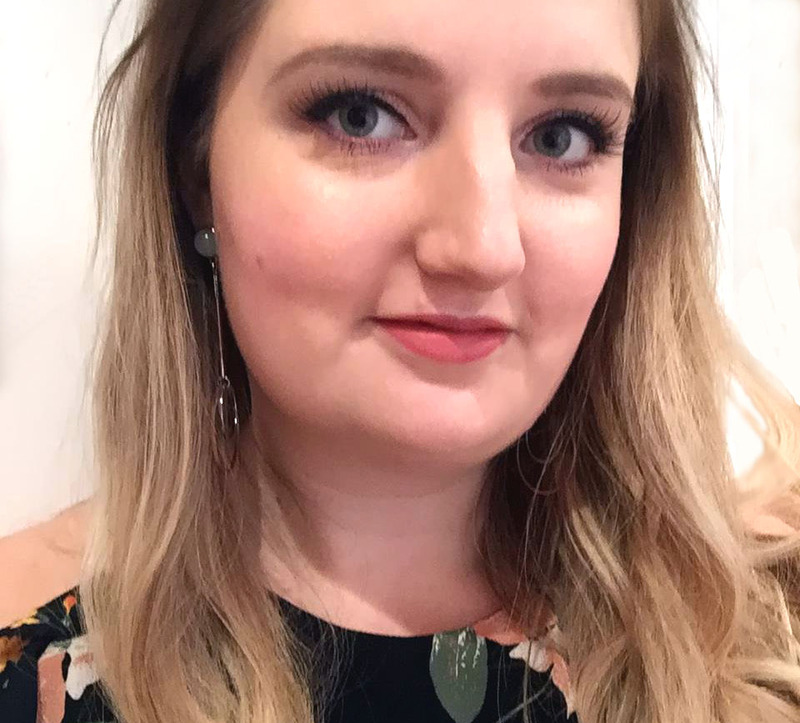 Time is passing very quickly and without realising it I am once again a week behind with my Great British Bake Off -inspired posts. 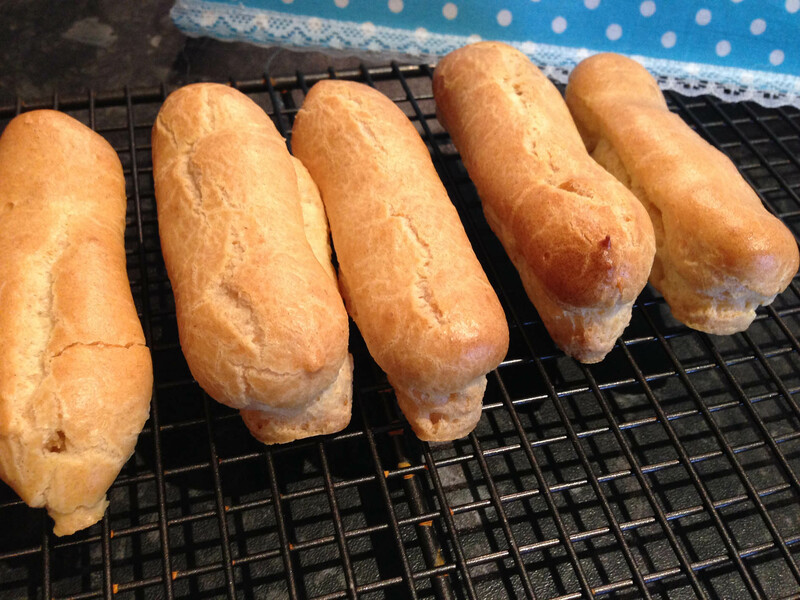 This time the challenge was pastry, and rather than attempt puff pastry, which quite frankly looks like something I really don’t have time for, I decided to give choux pastry a try. 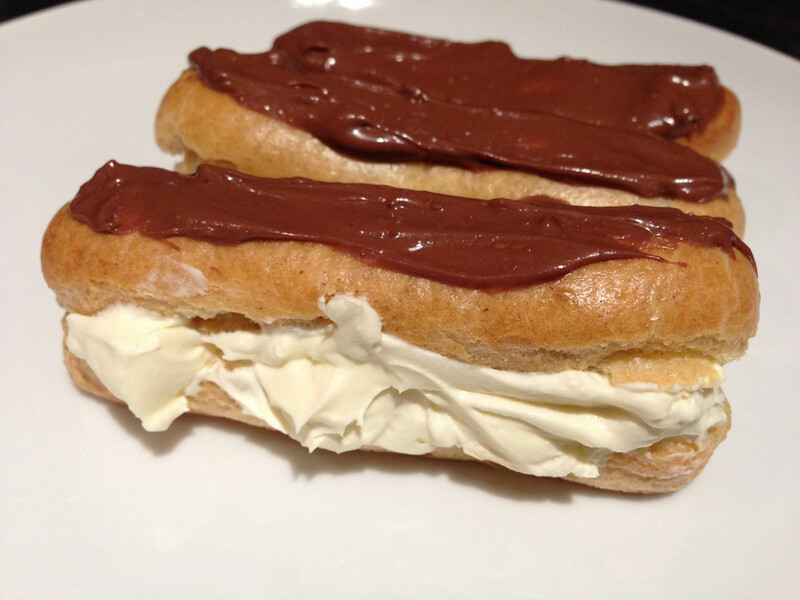 I couldn’t find much variety in recipe options so went for this classic – chocolate eclairs! 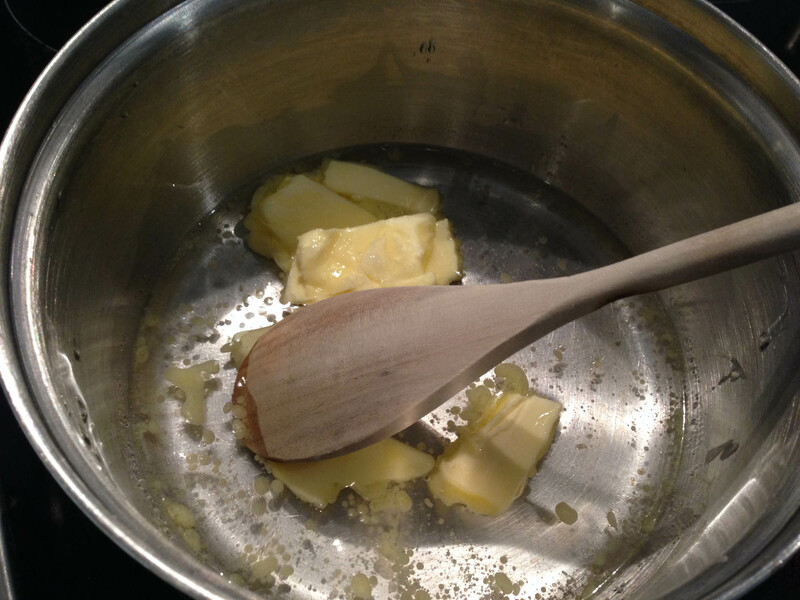 Melt gently the butter, salt and sugar together with the water in a saucepan. 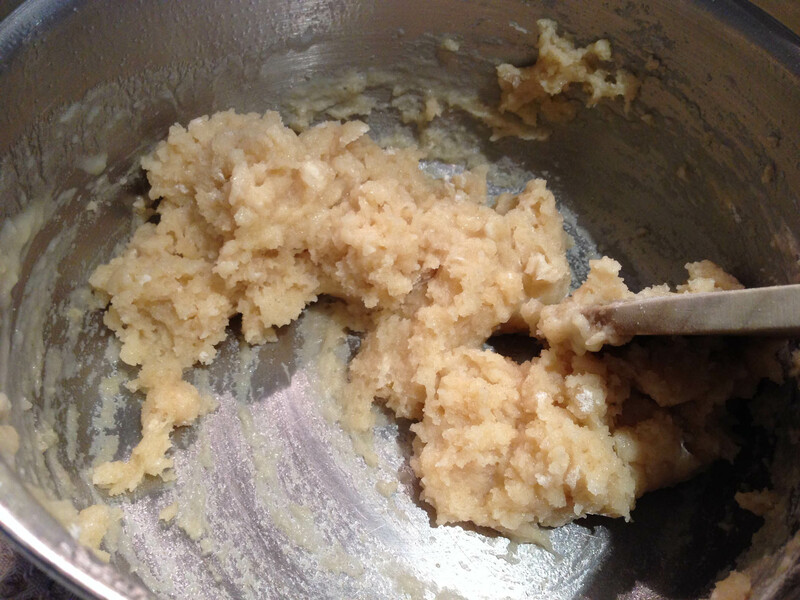 Once the butter is completely melted, bring to the boil and then tip in all of the flour (sifted). Beat the mixture in the pan with a wooden spoon. Eventually it all comes together into a smooth ball of dough. 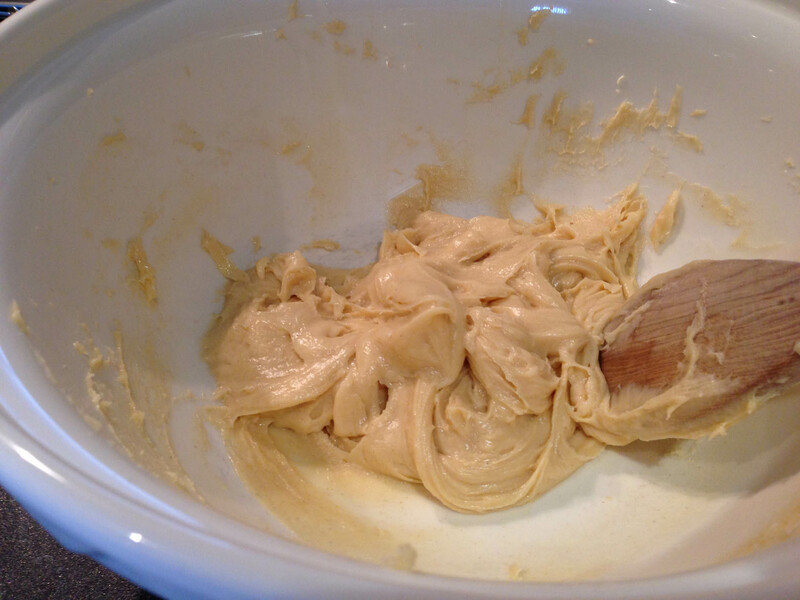 Leave the dough to cool for 5 or 10 minutes in a mixing bowl. 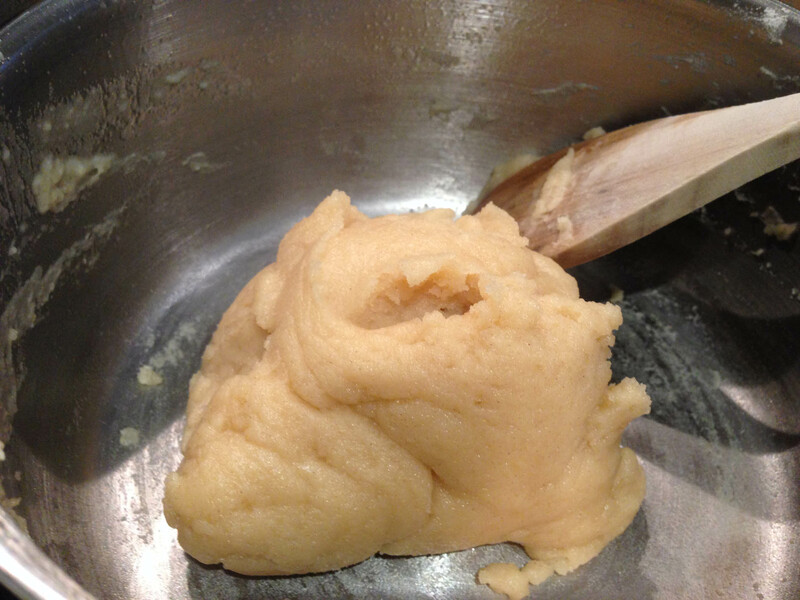 Then start adding the egg in small amounts to the mixture, beating with an electric whisk. The mixture should end up smooth and just soft enough to drop from a spoon when shaken – it still needs to be stiff enough to pipe, which may mean you don’t need to add every last bit of the beaten egg. Using a piping bag with a 2cm nozzle, pipe the dough into 10cm lines onto a baking tray lined with baking paper. Make sure they are spaced fairly far apart to allow for the dough puffing up. Bake for 15 minutes on 200°C. Then open the oven door to let the steam escape. Turn the oven down to 180°C and bake for another 20 minutes. Finally, pierce holes in each end of the eclairs to allow the steam to escape (I used a skewer to this) and bake for just 5 more minutes on 180°C. I actually found choux very easy to make following these guidelines. I think the key is just to make sure you don’t add too much egg so that the dough can still be piped, and to bake the pastry long enough so it is properly dried out, which means allowing any steam to escape. 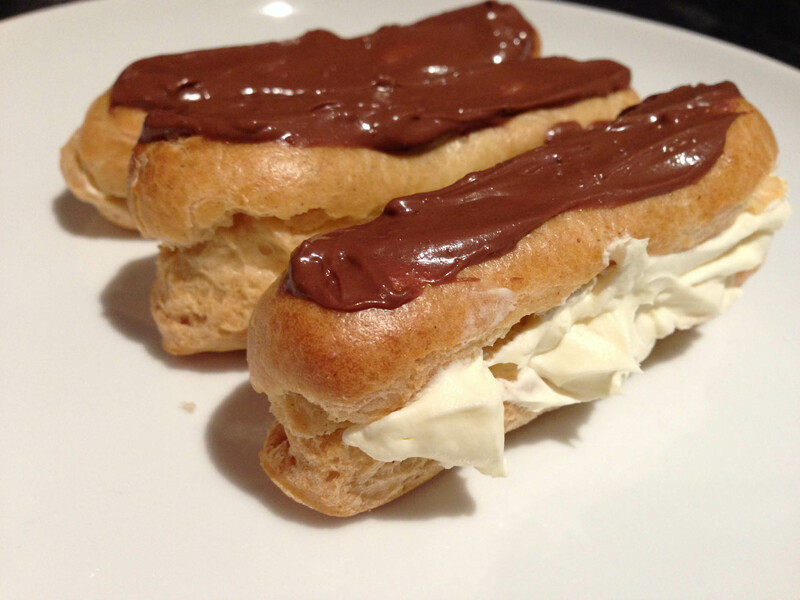 I filled my eclairs with Chantilly cream (double cream whipped together with icing sugar and vanilla extract) and topped with melted chocolate – delicious! Overall I pretty pleased with how these turned out! Tried out this recipe this afternoon, really easy and tasty results! Thanks for sharing.